Where Did Western Culture–and Christianity–Go Wrong? In an age of nihilism, the more reflective among us will pose a fundamental question: where did Western civilization veer off course? It’s easy to blame hippies from the 1960’s or, more correctly, the Enlightenment era of revolutions, but Europe’s fate was sealed far earlier than the Proclamation of the Rights of Man. The West’s destiny was determined a long thousand years ago, in the run-up to and aftermath of the Great Schism of 1054. Without the guidance of the saints and without the true teachings, post-Schism Europe would experience a distortion of many of the Church’s understandings; translating them in ways which would serve as future fuel for counter-reactions and/ or future deviations. A post-Schism Europe would eventually give way to the Reformation, the Renaissance and the Enlightenment and other ideologies and movements, including today’s European Union. These very movements (and the Zeitgeist they carried) would give undeniable testimony that Europeans had found themselves deprived not only of living saints, but of the very understanding of what is Christianity, the Church, man and the reason for man’s existence. Indeed, such ideologies and movements were to warp the understanding of such things as they were to erase from memory Christian orthodoxy, the Church based on the Nicene Symbol of Faith, and of the Church’s hesychastic ethos. Not only the reality, but even the concept of ‘Christianity’ in this post-Schism Europe was eventually to be lost. Christianity was instead to be defined as Roman, Protestant, sectarian or Western. Yet Christianity was not about the Bishop of Rome, indulgences, the Reformation, the Counter-Reformation, etc. Europeans, unlike their pre-Schism forefathers, were now oblivious to the fact that ‘Christianity’ was only to be synonymous with the Holy Church (the Body of Christ). In post-Schism Europe the use of the word ‘Christian,’ in reference to another body outside His Church, was eventually to become not only possibility, but a reality. In other words, Europeans were to find themselves no longer able to distinguish between a pre and post-Schism Christianity. No longer was the Church to be synonymous with Christianity or Christianity with the Church. Instead, though a series of events, Christianity in Europe would only come to signify a plurality of churches and of christianities. The orthodoxy of the One, Holy, Catholic and Apostolic Church was to lose its reality as Christianity was becoming relativized. Hence, it must be emphasized here in this thesis that the word ‘Christian’ or ‘Christianity’ when in capitalized form denotes the holy pre-Schism Church and Faith; when it is not capitalized it marks heretical forms of Christianity and bodies which do not represent the Body of Christ, yet nevertheless, kept and/or misappropriated for themselves some or many of the Church’s tenets. This distinction is important in order to note that pre-Schism Europe, which had living saints, was something vastly different from the saintless Europe of today, as Christianity – the Church – had and has saints, but a post-Schism Christianity without the Church produced no saints. The Saints of Britain and Ireland. Pre-Schism Europe was pious in the true Faith. However, post-Schism Europe was to be ever-more oblivious to such piety and a life in Christ. Furthermore, the piety that was to be found would be something vastly different from that of pre-Schism Europe. Yet, in time, modern Europe was to lay aside even this ‘Medieval’ form of piety, substituting in its place new forms of knowledge, reason and science – in short, new faiths. Again, this modern Europe was to not see that prior to her Middle-Ages, Europe had a different form of piety and understanding of the Faith; that in fact, Europe of this time had true piety and the true Faith. 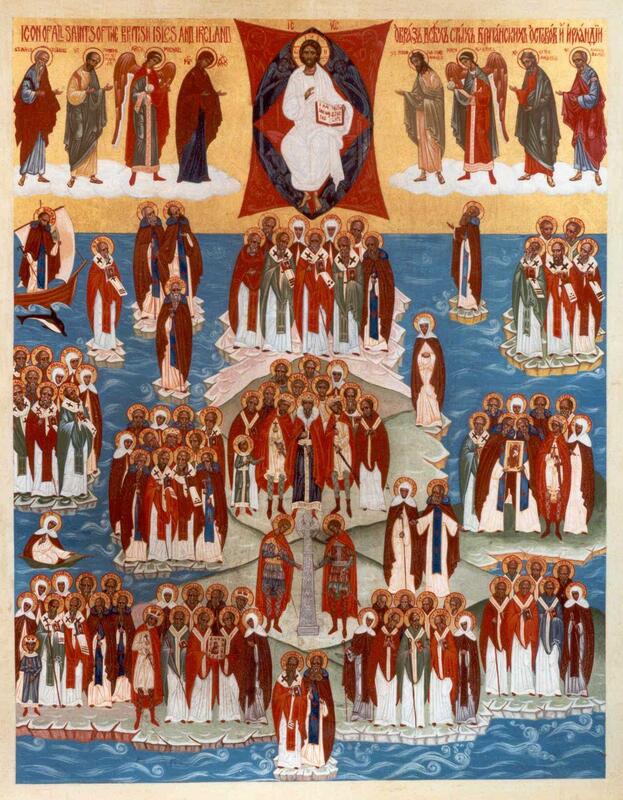 As a result, Europe had lands which saints walked among and which a distinct Spirit was welcomed in. This was to change however. The Roman Catholic and the post-Reformation civilization were to determine (thereafter) the entire history of Western European civilization. Indeed, such civilizations would be an impetus for the development of many other non-Church and anti-Christian ideas and philosophical teachings, which “greatly influenced all subsequent history of [Western] thought” (Osipov, 2010) and which ultimately coalesced to form the post-modern, post-christian era which the European Union is now part of. Without saints, without the Spirit of Truth, without the Church, without a life in Christ the latter was bound to happen. For example, without a reason based on the Orthodox faith (of the saints), the post-Schism Reformation was to provide Europeans a faith based on reason. And with relativism, Christianity – as a the Template by which life is measured and as the Lens by which life is seen – was to be nullified as other templates and lenses were to co-equally place themselves in the minds and hearts of European man. And with humanism, man, and not God, was to be the center of the universe. Accepted and legitimized by the western church(es), “rationalism, atheism, pantheism, and various [unorthodox] ideas and movements continued to spread” reaching the point where in the 20th century Europe was to find itself riddled with atheistic, humanistic, pagan, secular and materialistic world-views; things testifying to a further alienation from the pre-Schism ethos mentioned earlier. This brief portrayal of pre and post-Schism Europe is meant as a backdrop to the Europe that was to give rise to the phenomena of totalitarianism. We hope to illustrate that in comparison to the pre-Schism Christian Europe, the post-Schism Europe was to eventually make its way to a modern and post-Christian era with a social/cultural matrix fostering the very roots of totalitarianism. Ignorance… toward the fact that Europe was once a Christian land that living saints helped establish and secure, that Europe was once orthodox in her Christian faith; that with the onset of the Great Schism, a new form of Christianity was to develop, which most Europeans were to mistake as orthodox, that as a result, strange new developments were to lead Europe unto dangerous paths; paths which the European Union inherited and perpetuates. Arrogance… in the sense that Europeans would no longer care about seeking Christian orthodoxy, but instead develop ever-more sophisticated sophistries and sciences believing that such developments are wise. The French Revolution comes to mind as does Napoleon, European imperialism, atomic weapons, etc. This aforementioned ignorance and arrogance can be simply be reinterpreted in the question, “What is ‘man,’?” that is to say, how are we to value the human being, how are we to define him, what is the purpose of his existence, what social arrangements are suitable for humanity, what entails human freedom, etc. This anthropological dimension is the key in determining whether man is, was or will be captive to a totalitarian context. Previously, even in a post-Schism Europe, human freedom was connected with a Christian cosmology. In our post-Christian times, however, this notion seems to have been lost. It is this thesis’s contention that without the Church, without the saints, without the Holy One, without the hesychastic understanding of the Faith, Europe perhaps is or will be ripe for another (and this time more sophisticated and more subtle) form of totalitarianism as the anthropological answer to the question of what is man would be connected less with God, and more with governance. No longer was man to be first and foremost among God’s creatures, but a wholly political creature; a creature of the state. Less and less was God to be relied upon, as mankind was creating for itself a dependence upon as well as submitting to systems of governance. This anthropological dimension, of Europeans losing the knowledge of who they are and of creating for themselves their own identity, manifests itself in culture. If saints are not to be found, if the prime representatives and ideals of mankind – if images of Christ – no longer exist in Europe, then mankind will create a culture according to their own image. Another way of looking at this is by looking at the ideas that man have about themselves. This concerns both the individual as well as the society he/she inhabits. As ideas have consequences, as how we think determines how we act, then collectively, we will come to share ideas of right and wrong. However, without the saints to show us what are the true ideas of who we are and what are the true values we should aspire to, then European man and society is left with their own constantly evolving notions of right and wrong. Tragically, in post-Schism Europe, Europeans by in large have inherited a moral redefinition of man that has obscured who he is and what values he should seek. This is a consequence of a post-Schism trajectory which came to produce saint-less lands and strange movements, isms, teachings and doctrines. No longer was Europe to produce “uncanny people” – faithful of the pre-Schism fold, who were to see themselves truly as sojourners in foreign lands; awaiting for and aspiring to be in His Promise. 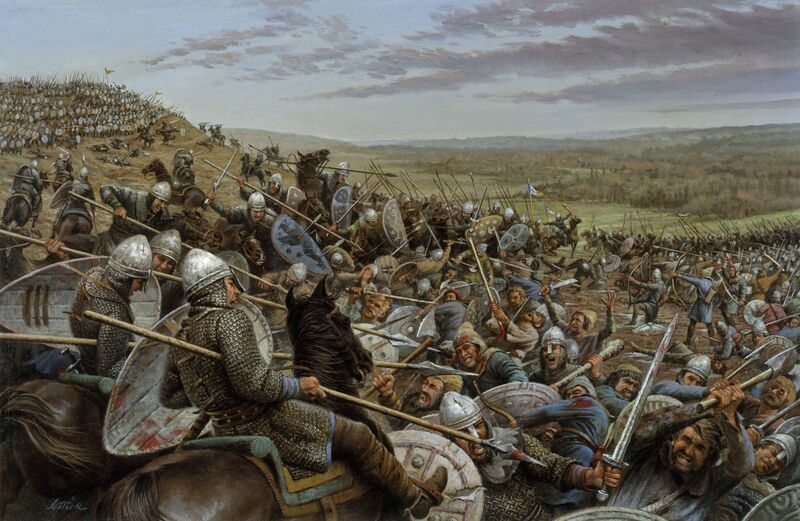 The Saxons’ valiant last stand: Hastings, 1066. In Politics and the English Language, Orwell further illustrated how the meanings of words are subverted to stand for ideas and concepts that are not true to their meaning. This co-opting of the Christian moral lexicon is one reason for the deep moral confusion in the culture. It creates a kind of moral schizophrenia in which people are unsure if right and wrong even exist. Repeat certain words over and over again, and people will tend to believe them. If these words have moral power, which is to say if they derive their authority from the moral tradition, people will tend to believe their new applications are the tradition. All it takes is wrestling common terms from their traditional moral contexts and employing them in ones that justify the dehumanization as progress. Good becomes evil, and evil becomes good. Society has reconstructed itself in a new moral order. The latter implies that if mankind no longer seeks freedom in Christ, than they will seek freedom in some surrogate; possibly even in a political system (consciously or unconsciously). And so the trap is laid – proclaiming his liberty, man enslaves himself, and building his earthly paradise, he finds the abyss. For example, the church in Rome at that time accepted an earthless sky, that is to say, that she viewed the physical nature of humanity as vile and to be combated against (as shown by its strange and extreme forms of ascetism). Furthermore, the prevailing ethos at this time tolerated the earth as an inevitable evil. However, our contemporary times, due to a long series of reactions (against these distorted interpretations), “mainly knows the earth;” that is to say, there is no Heaven as Heaven is on earth; and one’s paradise is only found therein. In other words, in the West, God’s kingdom began to be viewed more as an earthly kingdom. ‘Post-Christian’ here signifies the triumph of secularism. – author’s interpretation. Solzhenitsyn, again stressing the anthropological dimension, himself acknowledged this point in the Harvard address: Yet in the early democracies, as in the American democracy at the time of its birth, all individual human rights were granted on the ground that man is God’s creature. That is, freedom was given to the individual conditionally, in the assumption of his constant religious responsibility. Examples: Renaissance, Enlightenment, Positivism, Romanticism, Scientism, Atheism, etc. American B-2 Stealth Bombers to be Equipped with Versatile New B61-12 Nuclear Munitions Capable of Lethal Earth Penetrating Strikes; North Korea and Russia in the Crosshairs? Hey Buddy!, I found this information for you: "Where Did Western Culture–and Christianity–Go Wrong?". Here is the website link: https://russophile.org/where-did-western-culture-and-christianity-go-wrong/. Thank you.